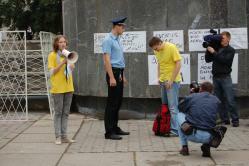 Events » Resource Platform "initiative activists: Human Rights' » Ukrainian Youth Shows a Yellow Card to Police Officers! 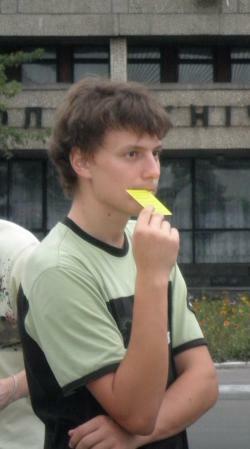 Ukrainian Youth Shows a Yellow Card to Police Officers! On the International Knowledge Day, which is celebrated on the 1 of September, human rights activists held a large-scale action titled Defend Yourself on Your Own. It was a forced measure – a response to systematic violations of human rights by the representatives of the law-enforcement organs of Ukraine. The basic aim of the action is to raise awareness among young people about the protection of their rights upon the contact with police officers. The action was held due to the financial assistance of the Norwegian Helsinki Committee within the framework of the project of the Ukrainian Helsinki Human Rights Union (a mini-grants program Youth Groups Initiatives: Human Rights implemented within the Understanding Human Rights All-Ukrainian Educational Program. Students, the representatives of creative youth, NGO activists and the graduates of the Understanding Human Rights Program gathered in front of more than thirty various educational establishments and shared information about illegal arrests, interrogations, examinations, and acts of force practiced by the law-enforcement agents against young people all over Ukraine. The public campaign was supported by more than thirty educational establishments in Kyiv, Luhans’k, Kharkiv, Chernihiv, Odesa, Mykolaiv, Zhytomyr, Simferopil’, Ternopil’, Rivne, Sevastopil’, Yalta, Mariupil’, Kremenchuk, Komsomols’k and Hlobino. In Kyiv young activists staged a theatrical performance right on the Square of Knowledge near the National Technical University of Ukraine (KPI). In the middle of the Square they arranged cells of a symbolistic pre-trial detention facility, where there were put students who didn’t know their rights and were not able to defend themselves from infuriated police officers. 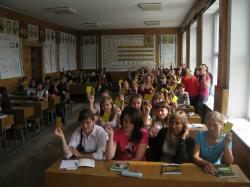 In such detention facilities the activists informed the students on their rights and gave them information cards. “It is ridiculous, but we are often forced to defend ourselves from the law-enforcement agents. If police officers don’t remember that they are to observe human rights and to fulfill their obligations, we have to remind them about this,” Roman Shmal’ko, the coordinator of the action in Kyiv, commented. The action in Luhans’k included a theatricalized “lesson”, during which all the students and passerby were offered to give a piece of advice to a potential victim of illegal actions of police officers. In order to provide the protection a pillow was fastened to “a victim”, a hard hat was clapped on her head, and she was even given an unchangeable twenty. With the help of such outfit organizers wanted to show that it is impossible to defend one’s own self without the knowledge of rights. “Of course, this protective outfit has its pluses and minuses: pillows protect essential organs, while a helmet cushions a blow. However, this outfit will not save from arrests and examinations,” Yulia Krasil’nykova, the graduate of the Understanding Human Rights All-Ukrainian Educational Program and an action coordinator in Luhans’k, explained. 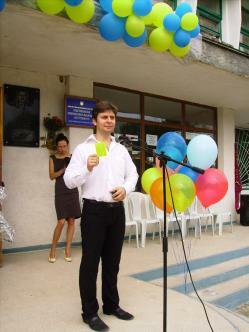 Action organizers in Chernihiv held a forum theatre performance for passerby. They played up a typical conflict situation involving young people and police officers. While discussing the performance the spectators arrived at a conclusion that it is not worth being afraid of police officers, that it is necessary to stay calm while at a police station, to demand showing a service certificate and informing relatives, and, most importantly, to know the grounds for detention. After the action the organizers were invited by the representatives of the Chernihiv City Center for Family, Children and Youth to hold a forum theatre performance in city schools. In Kharkiv the action was joined by the biggest universities of the city, such as the Kharkiv National University named after Karazin, the Kharkiv National Economical University, and the Kharkiv Pedagogical Institute etc. “When people see an approaching police officer they are overwhelmed with shock, become panic-stricken and don’t know what to do in general. Our brochures and the cards published by the UHHRU in partnership with other organizations simply provide people with information on what to do and how to speak correctly with police officers,” Ruslana Kurenchuk, one of the coordinators of the action in Kharkiv, said. In Sevastopol’ human rights activists held various actions in eight educational establishments, such as secondary schools and universities. Apart from speeches at grand meetings dedicated to the beginning of a new school year, the representatives of the NGO Myrotvorets’ (A Peace Maker) shared the information cards and explained the students during the lessons how to speak with police officers. The Sevastopol’ initiative gained support of ten local organizations. In Ternopil’ region the action was joined by teachers from local educational establishments and the members of local councils. Apart from distributing informational materials the human rights activists organized round table conferences and gave lectures. “It is possible to put things right only if the government machine representatives are honest. Bribes and bureaucracy are a direct consequence of people’s indifference. If citizens start learning to defend their rights, the government machine will start changing. The legal opposition will, first of all, improve the defence and law-enforcement agencies,” Dmytro Korokh, a coordinator of the action in Mariupil’, mentioned. In Rivne the action wasn’t stopped even by the downpour. “We are sure that the campaign turned out to be useful and that we should continue holding such mass events with broad involvement of mass media,” Kantariia Zurab, an action coordinator in Rivne, emphasized. 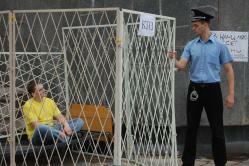 In Mykolaiv the campaign will be implemented in three stages. During the first stage that will last from 1 September till 7 September the information cards will be distributed among young people. On 6 September a lecture will be given in the Mykolaiv State University named after Petro Mohyla. Everyone who is interested will see the presentation of the project and will be informed on how to protect oneself from the outrage of police officers and how to speak with the law-enforcement agents. The third stage will include specialized lectures and seminars on human rights. “A yellow card for police officers in the hands of students is a sign that there are less and less people who are indifferent towards problems. Young people are ready to learn to defend their rights effectively. 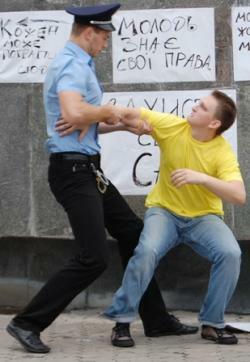 1 September 2010 is a day of the NEW knowledge that concerns legal self-defense. That is why the action is called Defend Yourself on Your Own. The chief organizer of the action Yaroslav Minkin explained that after receiving new knowledge, young people will be able to understand better the reasons of conflicts. They will learn to observe laws and will demand that the representatives of the law-enforcement organs should observe laws likewise. Submitted by xiaojun on Fri, 2017-10-13 18:06. Submitted by lcklck16 on Thu, 2017-08-03 12:01. Submitted by chenjinyan on Tue, 2017-07-18 06:05.